Spending most of my days sewing, I tend to have a lot of fabric scraps. I have a box of them that will eventually be cut into 2” squares and made into some sort of amazing quilt. If they’d just take care of that square thing on their own it would go a lot faster, but they seem to be waiting for me. This batch of scraps didn’t make it into the box though, and instead became this springy table runner. You have until March 8th to enter to win this, along with the Mug Hot Pads I showed you last week, my Craft Warehouse Design Team apron, some great cookbooks from Tuttle Publishing and a grocery list/menu pad I’ll be sharing here soon. If you haven’t entered, get over there! You can also still enter to win the gift certificate from Uncommon Goods. 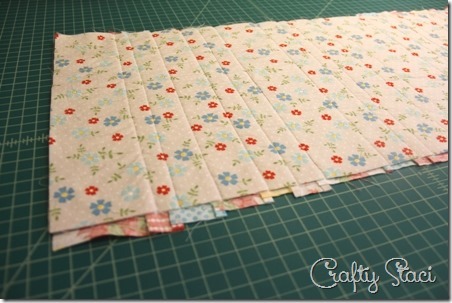 In the meantime, I’m going to show you how to make this easy table runner. It’s a great way to use up small pieces of fabric, and they don’t even need to be uniform in size. In face, I think it’s better if they aren’t. To make this, you’ll need to cut a piece of cotton fabric for your backing in the approximate size you’d like your runner. You may find it shrinks a bit as you sew it together. You’ll also need a piece of thin batting in the same size. I went with 12 by 30”. Cut strips for the front that are slightly longer than the back (14”) and in varying widths. You’ll need to account for seam allowances, so you’ll probably need more strips than you think. Lay the backing face down. Add the batting on top, then pin the two layers together with safety pins. And pin some more. You don’t want those two layers shifting while you complete the remaining steps. Another option would be to use fusible fleece, and just iron it onto your backing. Lay one fabric strip, right side up, in the center of the runner. Add a second strip on top, right side down, lining up the raw edges on the right. Pin in place and stitch down the right side with a 1/4” seam. Fold out strip on right and press the seam. Add another strip, face down, even with the edge of the first strip. Do the same with the second strip. Stitch both sides with a 1/4” seam. Flip them out and press, just like the first two strips. 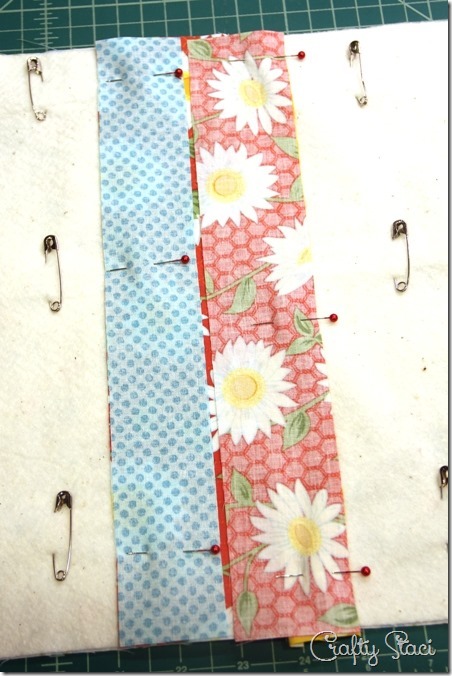 Continue, adding one strip to each side and removing the safety pins as needed. Stop when the batting is completely covered. Trim the edges so they are even with the backing and batting. To finish the edge, I cut binding strips from one of the fabrics. Because of the direction I had to cut them, based on the fabric I had available, if I stitched them into one long strip the diagonal lines were going to go in two different directions. Instead, I bound one edge at a time, starting with the long edges and folding the ends of the binding in 1/4”. After those sides were finished I added binding on the short edges so the lines would all run in the same direction. That’s it. No additional quilting is necessary, because all the layers are bound together between each strip, as you can see on the also-usable back. I have to admit, I really loved how this little runner brightened up the table, and it’s going to be tough to give it up. That’s how much I appreciate you guys!